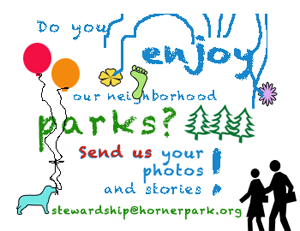 Horner Park held two fantastic events on March 26. In cooperation with the Chicago Park District staff, HPAC assisted with the first annual Lunch with a Bunny event which was attended by 150 guests and on the same day we hosted 225 dogs for our annual Doggie Easter Egg Hunt. 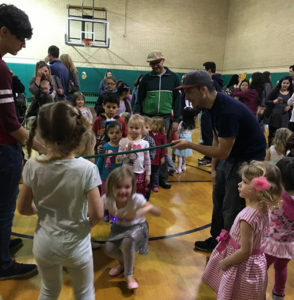 The luncheon was a sold out affair that had among other activities face painting, dancing, an Easter Egg Hunt and of course lunch. Lou Malnati’s of Lincoln Square was kind enough to donate the pizza and the service. Dessert, juice boxes, water and pop were served as well. HPAC provided goodie bags for the children so every kid left with something to remind them their wonderful day. Proceeds from Lunch with a Bunny will go towards HPAC’s general fund. For the Doggie Egg Hunt the weather was absolutely perfect. Dogs from all over the city arrived in their finest attire and at the designated hour they stormed the hill where treats were hidden, but not for long. Afterwards there was a dog parade and a costume contest. Dogs of all colors, shapes and sizes had a great romp together! 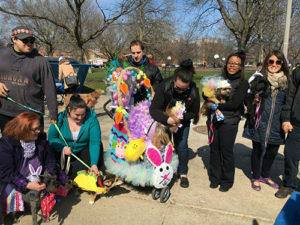 Proceeds from the Doggie Easter Egg Hunt will benefit the Dog Friendly Area committee’s efforts. Thanks to everyone who came out, thanks to our volunteers, thanks to Lou Malnati’s and a special thanks to our supervisor Deb Groh and the CPD crew who worked tirelessly to pull off both events! We look forward to bigger and better Easter activities next year!